Making good decisions and executing well on those decisions are basically the only things that matter in life. I recently shared my book notes on Good Strategy / Bad Strategy, which explains how organizations can develop better strategies. This book is similar but focuses on how individuals can make better decisions, especially for the important aspects of their personal life. The approach is simple and the examples are relatable: buying a house, changing careers, planning an event, etc. The authors coined this somewhat helpful acronym: PrOACT, which stands for Problem, Objectives, Alternatives, Consequences, Tradeoffs. The most common (and most easily avoided) mistake people make when deciding things is that they just don’t think about it. They just go with the gut. For smaller decisions, this isn’t always a big deal, but for bigger decisions, just taking a few minutes or a few hours to carefully think through a decision can make a big difference, especially given how bad our brains sometimes are at making decisions. It’s useful to start off by asking yourself what problem you are trying to solve exactly. Their example is of a family that’s outgrowing their current home. One problem definition might be “What new house should we move to?” but perhaps a better one is “How can we find a home that fits our family’s needs?” which includes the possibility of renovating the current home. Objectives are what really matters to you in your decision. Before you look at your options, you should first think about what success looks like. What would constitute a best-case scenario for your decision? For example, if you’re choosing a new office, your list of objectives might be minimal commute time, low cost, lots of space and fully staffed administrative services. It’s important to try and list all possibly relevant objectives to help you guide your decision. Include both quantitative and qualitative objectives. If you have other stakeholders, involve them in the objective finding process. Ask other people who have made this decision if there are other objectives you should consider. Do your best to refine your objectives, asking “why?” until they are an accurate reflection of what you truly care about in this decision. This is where you review your options. The key is to ask “How?”. How can you fulfill your objectives for this particular problem definition? Don’t try to evaluate the alternatives just yet, focus on generating as many as possible. Question your constraints – most of the time, we put assumed barriers around our options. For instance, if you were thinking about what laptop to buy, you’d open up a lot more alternatives if you considered refurbished options or other solutions like using an iPad with a keyboard. Do your own thinking first, but then consider asking others for their suggestions. Consider alternatives that give you more time and or more information. Sometimes the best alternative is a process one (voting, arbitration, random draw). Of course, after thinking hard about your alternatives and finding at least a few that you might be happy with, move on to the next stage. While we focused before on quantity for both objectives and alternatives, if you have a ton of items, it’s worth condensing a bit as this next section will otherwise be rather time-consuming. Here is where you look at how your alternatives will play out. Put yourself in the future and imagine you are now living with one of your alternatives. Write down a free-form description about the consequences of this particular alternative. If in this process you think of new objectives, consider whether or not you’d like to add that to your objective list. Do this free-form thinking for all alternatives, then weed out any clearly bad ones via “King of the Hill” comparison (where one alternative starts off as the ‘champion’ and is pitted against another alternative, the winner takes on the next alternative, etc). Take your remaining alternatives and create a consequences table that displays how well each alternative stacks up against all the objectives you’ve specified. Try to quantify how well the alternative fulfills the objective and if that’s not possible, create a ranking system that reflects the range of outcomes. Decisions with multiple objectives cannot be resolved by focusing on any one objective – there are always tradeoffs. The key is figuring out what those tradeoffs are in a thoughtful way. Look at your consequence table and eliminate dominated alternatives – if alternative A is equal or better than alternative B in every way, then you can say alternative A dominates alternative B and thus eliminate B because it has no chance of being the best option. Make tradeoffs using even swaps – a technique suggested back in 1772 by Ben Franklin. Figure out what you’d trade on one objective to get more of another and use this knowledge to clarify your consequences. For instance, with the job hunting example, how much of a salary hit would you take to the Twitter job to raise “Like the Team” to awesome? Same for the Pepsi gig. Now you can cancel out the “Like the Team” objective because they are all the same. Continue doing this for all objectives until you are left with only one. This system sounds complex, but our brains are actually pretty good at making these types of swaps so with a little practice it shouldn’t be too bad. What are the key uncertainties? What are the possible outcomes of these uncertainties? What are the chances of each outcome? What are the consequences of each outcome? The key here is to capture the most critical uncertainties (as there are potentially an infinite number to choose from) and provide best-guesses on chances of each outcome (which should be mutually exclusive). Yes, it’s impossible to capture all the uncertainty, but doing this exercise will take you to a better end result then just “winging it” or going by gut alone. A great way to visualize the uncertainty is with a decision tree. Here’s one from the book about a woman’s decision on whether or not to go to court for a personal injury lawsuit (or take the settlement). Given the same uncertainties, different people would prefer different outcomes. Most people are moderately loss averse and would prefer to avoid bad outcomes, even if they have a shot at really great outcomes. The book also discusses creating utility curves for evaluating specifically quantitative risk decisions (like investing money) which I’m going to skip over. 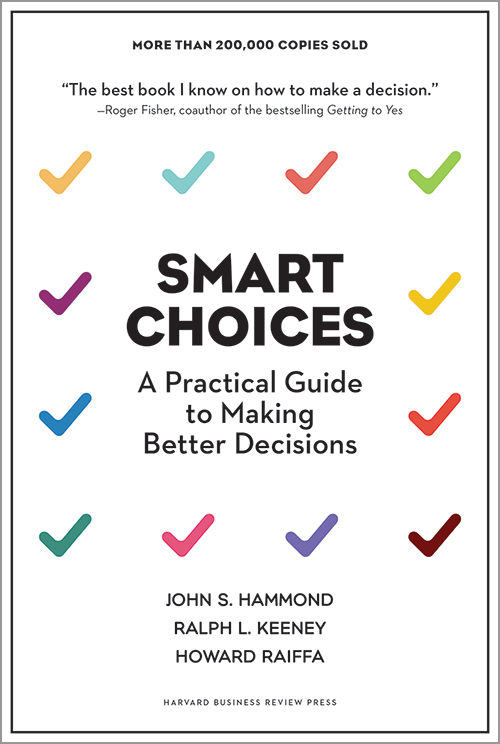 The book discusses linked decisions – which I think is relatively straightforward: certain decisions open and close doors for other decisions. Keep this in mind especially when you’re formulating your problem definition – it’s probably better to choose a smaller decision that can be made quickly, especially if it results in more information and options for future decisions.